Your elders likely critiqued your posture when you were a youngster, but turned out, posture is important even for those of us who aren’t walking the runway or attending a fancy tea party. If you have any form of chronic pain or arthritis, using good posture is essential for protecting your joints, strengthening muscles, preventing pain, and even conserving energy. Chiropractors and physical therapists will agree that proper posture is a key component to musculoskeletal health, especially as it relates to the back and spine. We want to keep the spine aligned and balanced at all times, as best we can. 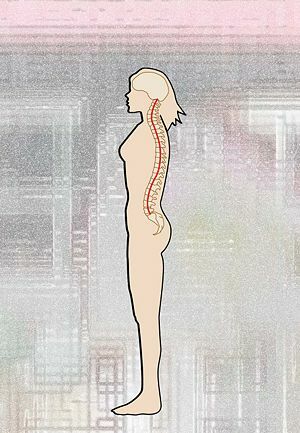 This is what “good posture” is. If you were to view at your spine from the side, it would look like kind of like a flattened “S.” In many cases, the lower curve of the “S” – your lower back area – essentially gets abused. We sit slouched on the couch or hunched over a desk or table, pushing out that lower curve. Others may stand with our knees locked and our shoulders back, exaggerating that lower curve, but both of these postures can stress the muscles and joints of the lower back, cause discomfort, and waste energy. Imagine a string, attached from the ceiling to the top of your head, lifting your head, neck, and shoulders upward. Keep your shoulders relaxed. Do not lock your knees when standing. Wear a good shoe that promotes balance and provides stability. If at all possible, use a chair that supports your lower back and helps maintain the slight curve in your lower spine. If you can’t find this kind of chair, tuck a pillow or wedge between your lower back & back of chair. When possible, sit with your knees slightly higher than your hips and your feet flat on the floor. If necessary, prop your feet on a stool or book to keep your knees at the proper height. Get a firm & supportive mattress for your bed. Get up and move. As muscles tire, slouching, slumping, and other poor postures become more likely; this in turn puts extra pressure on the neck and back, so change positions frequently. Try yoga, which can improve alignment and posture. 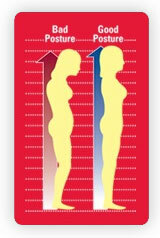 Try physical therapy or chiropractic to help with posture issues. Do exercises that strengthen the back, neck, and shoulders. The stronger your muscles, the less chance of slouching and overcompensating. Using a mirror, try to align your ears, shoulders, and hips. Be aware of your posture. Be mindful of your body’s positioning throughout the day, and when it’s “off,” – simply correct it! Try to sleep on your back when possible. So, let’s make it our mission to give good posture a try! Leave a comment & let us know how you’re doing! Tags: ankylosing spondylitis, Arthritis, Arthritis Ashley, Arthritis Blog, Arthritis Foundation, Ashley Boynes-Shuck, Awareness, Back, Back Health, back pain, Balance, Chiropractic, chronic pain, Disability, Good Posture, Health, Human Anatomy, Human Body, Hunchback, Hunching, joint health, joint pain, Mid Atlantic AF, Mid Atlantic Arthritis Foundation, Mid Atlantic Region, Neck, OA, Osteoarthritis, osteoporosis, pain, pain relief, physical therapy, Poor Posture, Posture, RA, Rheum, rheumatic disease, Rheumatoid Arthritis, SHoulders, Slouching, spine, Spine Health, Wellness, yoga. Bookmark the permalink.